To save time and money for the owner of a 190-meter, 28,747 GRT bulk carrier, Hydrex removed the bow thruster of the ship and installed a new unit during the vessel’s stop in New York. By carrying out both parts of the operation while the ship was berthed, she could continue her schedule without going to drydock. The Hydrex technical department prepared every step of the operation in detail to make sure that the team could carry out both the removal of the old bow thruster unit and the installation of the new unit during a single operation, in the shortest possible time and without any loss of quality. Together with all the necessary equipment, a team mobilized from the Hydrex office in Tampa, Florida, to the vessel’s location. Because the vessel was trimmed to a position that brought the thruster tunnel out of the water, there was no need to close off the thruster tunnel. The team set up a monitoring station on a crane barge which was then maneuvered next to the ship. While part of the team removed the portside grid to get access to the thruster tunnel, the other diver/technicians went on board and prepared the engine room for the removal of the unit. 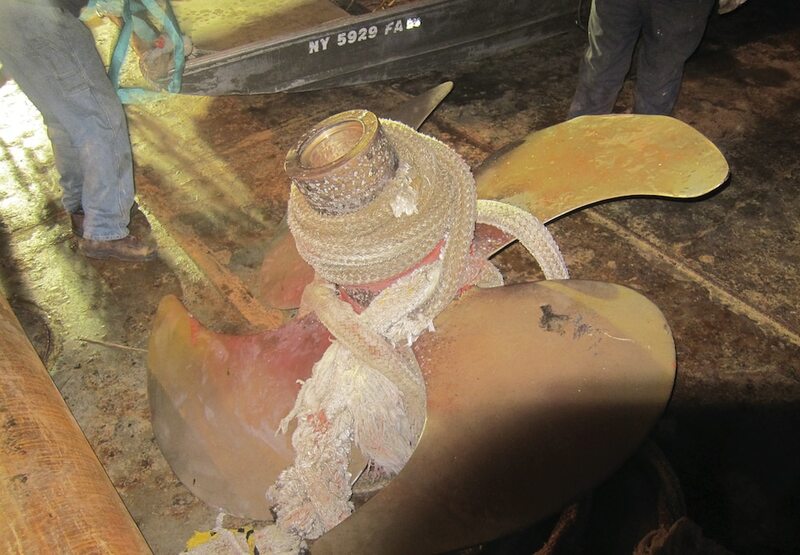 An inspection of the old bow thruster unit revealed that a mooring rope had gotten tangled around the propeller hub, causing the malfunction that led to the need for replacement. The divers removed the hub first. Next the team cut the support brackets connecting the gearbox to the thruster tunnel and secured the unit with chains. It could then be fully disconnected from the thruster room and was carefully lowered, extracted from the tunnel and brought to the surface. The new bow thruster unit was then lowered into the water and brought into the thruster tunnel. Next our diver/technicians positioned the gearbox using chain blocks and secured it with bolts. The team completed the operation by reconnecting the thruster unit to the engine room and reinstalling the portside grid. To keep the delay for the customer to the absolute minimum, diver/technicians worked in shifts around the clock. By performing both the removal and reinstallation of the bow thruster unit underwater the vessel did not have to drydock, saving the owner valuable time and money. Performing both the removal and reinstallation on such a tight schedule takes a lot of planning. This can only be done successfully by people who have familiarity with such challenges and the relevant know-how. This is why Hydrex has a technical department capable of executing all the required planning as well as the engineering aspect of an operation and diver/technicians who are trained and qualified to perform the full range of required class-approved repair procedures in even the harshest conditions. An effective, competent team is the only way to consistently achieve a high quality result in the short periods of time usually available to ships.